It’s true! 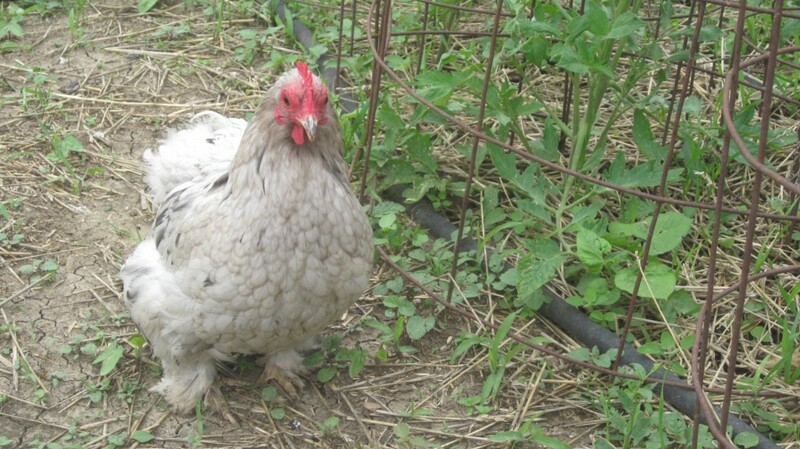 Backyard chicken eggs are more nutritious! We have a sorry window of egglessness here at our place. It’s a sad time. Our spoiled hens, you see, have spoiled us for really good eggs. For most of the year, our small flock produces more eggs than we can eat. But because of the seasonal schedule of the local butcher and the small size of my hen house, I have my old hens butchered in late summer, while the new hens (the pullets, or the “oshlots” as little Mack calls them) don’t begin laying until mid-fall. So we don’t eat many eggs during this dark, gloom-filled, eggless period of time. Store-bought eggs just don’t cut it. I guess that’s job security for our happy hens that have the free range of our place most of the time, and get scraps hauled to them from our house and the house of my mother, and also the house of my sister’s mother-in-law! Now perhaps you believe me when I tell you that they are spoiled. Plus, most of the day they are free to scrabble in the dirt and eat the things they like best: bugs, weeds, seeds, worms, and whatnot. Did you know, Gentle Reader, that eggs from truly free-range chickens are actually much more nutritious than the eggs from commercially raised birds? The nutrient levels in the two types of eggs are dramatically different, and researchers believe it’s likely the result of the drastically different diets. 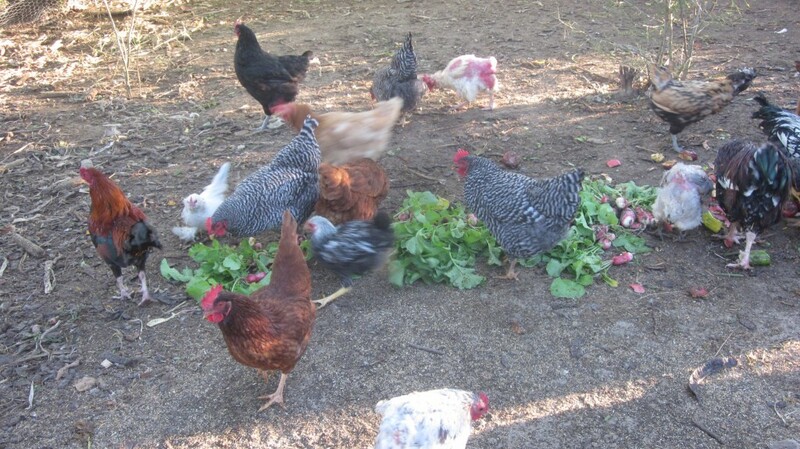 True free-range birds eat the natural diet of a chicken, which I listed above, along with the addition of a layer feed and possibly (in our case at our place) additional grains. Our chickens spend part of the day in their fenced-in yard, to keep the predators guessing. Here they chow down on some garden scraps. Riiiiight. Uh-huh. If you believe that, as my dad would say, I have some swampland in Florida that I’d sell you . . . You realize that they are trying to duck the entire issue by incorrectly defining “true free-range.” Here we go. The USDA (of course I hope you don’t take everything that comes down that pike as fact) defines that phrase “allowed access to the outside” synonymous to the phrase “free-range.” It merely means that producers can–and do!–label their eggs “free-range” even if all they do is leave a tiny door open on their giant sheds, regardless of whether the birds ever learn to go outside, and regardless of whether there is good pasture or just bare dirt or concrete outside those doors! Most of the eggs at the grocery store come from factory farms, where standard procedure is to stuff 5 to 10 birds into a cage 18″ x 24″. The cages are stacked by the hundreds in large buildings where dirt and feces pile up fast. You may be surprised to learn that most factory farm chickens actually carry E. coli, Campylobacter, and Salmonella in their bodies, and pass these nasty bugs on in their eggs. So please don’t trust the phrases you see on the egg cartons in the store as being what you’ve perhaps been led to believe is accurate. These amazing results came from 14 flocks around the country that ranged freely on pasture or were housed in moveable pens that were rotated frequently to maximize access to fresh pasture, yet protect the birds from predators. They then had eggs from each of the 14 flocks tested by an accredited lab in Portland, Ore. You can read more about this study right here, if you’re interested. You can trust me, though. As much as I love chickens and as much as I really adore good eggs, I’m not making this up! Here’s our Babes, looking for some tasty lunch in my garden. I hope she finds that grasshopper that was bopping around in the tomatoes. By the way, if you still believe that eggs are bad for you, then you’ve been mislead. Study after study, and even the Harvard School of Public Health have failed to show any link at all between eating eggs and heart disease, which is the suggested result of having high cholesterol. But for some reason, the popular media has just not been able to educate the public concerning this news! Chickens have been turning bugs and worms and seeds and weeds into breakfast for thousands of years. There’s no better way to get the protein, vitamins, minerals and fat that you need every day than to eat eggs. And though you can buy eggs from the store in fancy cartons with their own little egg-tattoos (EB) and they are better than nothing, there is a much better ways to get nutrition from eggs, and help your local economy. Of course the best way to get your eggs is from your own back yard. By having a few hens in your back yard you are suddenly a very powerful person. Like magic, you are now in control of your own food supply. You decide what goes into your chickens and thus what goes onto your family’s plate. There is no longer a Faceless Corporation intent only on profit between you and your food. Remember the distinction, Gentle Reader: chickens make food, corporations make profit. It takes me about ten minutes every morning to take care of our little flock, and of course the entertainment value of having a flock of hens cannot be ignored. Sometime during the day, I have a walk out to the coop to pick up eggs, and in the evening I’ll take another brief walk to shut them into their coop. That’s about it. If you’re not able to keep chickens, then do seek out a small farmer or a neighbor who actually does care about his chickens and wants them to be happy and healthy, and who allows his chickens free-range to pasture. You’ll notice that the eggs you buy will be much richer in color, tastier, and you’ll know that you are feeding your family the absolutely best eggs you can buy. Now that we’ve got a pleasant plethora of eggs again, I’ll start working our favorite egg meals again into our menus. Pancakes and waffles are popular, egg-rich meals around here, as are Tuscan Eggs, especially since we still have ripe tomatoes to pick. I like to have a bowl of boiled eggs in the refrigerator for breakfasts or just snacking, and I like a good fried egg sammage for lunch occasionally, too, don’t you. . . with just a skiff of mustard, a thin slice of onion, and a bit of spinach . . . ? Hey, I’m linking up with The Prairie Homestead and also Frugal Days, Sustainable Ways, in their blog hops. Hop on over! Tagged on: free-range chicken eggs are more nutritious, how to raise backyard chickens, nutrients in backyard chicken eggs vs factory farm eggs, why are free-range chicken eggs better for you? You make a great case for raising your own chickens. I wish you lived right next door to me. When it comes to being consumers it is our job to be aware of the kinds of things that you mention here, otherwise we will blinding buy what we see in the grocery stores and never really know what we are putting into our bodies. WOW – so much important info in this post! I have a neighbor that sells “brown eggs”. I’m going to stop in and find out if these are free-range or not. Time to start buying locally and nutritiously! Great post! It’s definitely worth seeking out a free-range source, Lisa! Good luck! Now, go pick up those eggs! Thanks for your notes, Roy! I appreciate the additional info, now it’s out to the chicken coop I go, to pick up some breakfast . . .
Wow, you and Dr. Ackerman really do need to meet for lunch, perhaps over some egg drop soup. Well then, I noticed you didn’t tell the people about the light trick used by the big corporations to produce more eggs, like keeping the chickens indoors and turning the lights off for a couple of hours every 6 or 8 hours so the chicken believes it’s another day and somehow thus produces more that one egg in 24 hours. That little trick also shortens the lifespan of the chicken. I have also read that if the chicken has access to as little as one square foot of land on the bottom of the cage, it can be sold as “free-range” in the supermarket. Now before Roy comes after me, I don’t remember where I read all of the above, and we do have our own hens, thus our own free range eggs. I hope to be adding a couple of turkeys and perhaps a duck or two, both of which produce great eggs for baking. So does this mean that you’ll have a couple of happy hens in your backyard soon? I only ever buy organic free-range eggs (I just hope they are genuinely free-range if the producer has gone to the trouble of feeding them organic food). I used to live near somebody who raised their own free-range organic chickens and rather bizarrely didn’t like eggs, so I had a constant supply and they were far superior to even the organic ones in the shops. I think the way battery and ‘free-range’ hens are kept is vile. In fact the whole industry needs a complete overhaul. We are what we eat, and I don’t want to eat the vibration of any animal or its products that have been treated so awfully. I certainly don’t want to ingest the cocktail of chemicals many animals are routinely fed second-hand. I’m not a vegan or vegetarian, but I do believe as a caring carnivore (I’m sure there would be some who would argue with that description!) the least I can do is make sure any animals I eat have had the best life they could while alive. Great post again! Bringing matters like this into our awareness helps people to make an informed choice. Thank you! When I was growing up, my mom always had a few chickens in the backyard, laying eggs for us and teaching us responsibility for them. Little did I know at the time that the eggs that we got were so much better than what we could buy in the store! I know when I do get the opportunity to eat free range eggs they taste so much better than “factory” eggs. Hadn’t really thought about the health benefits though. Great! Oh please please write part 2 (and 3 and 4) and get the word out. 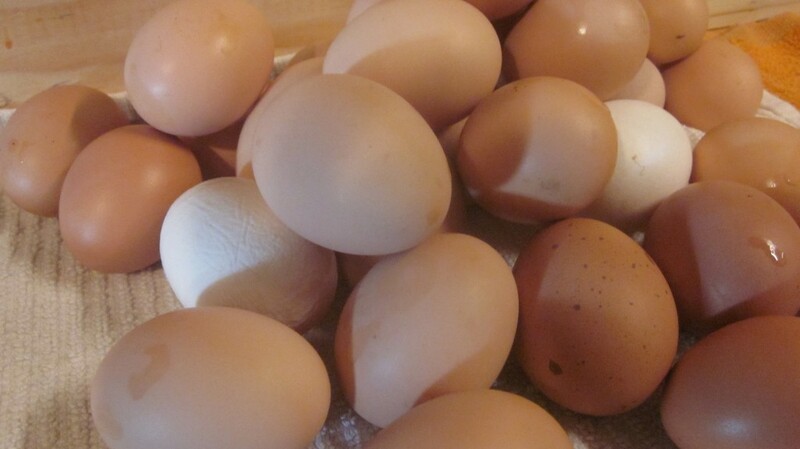 We personally don’t eat many whole eggs, but those we do buy come from local farmers markets. We have personally visited one of the farms (I will blog about this visit in a future post) and seen their chickens and they are truly free range. I think on and off about getting chickens again (I haven’t owned any in 27 years, back when we lived in rural Arkansas)- but right now our town (Town of Union, in New York) only permits chickens if you are a “rural resident”. We aren’t. Okay, Alana, due to overwhelming response (your note) maybe I will! THanks for your comment and I’m still looking forward to that chicken memoir you’re going to write! I remember the rich yolk color of our free-range flock of hens, ducks and geese. Now, we have to buy from a supermarket. Here in England, the supermarkets sell different qualities of eggs. We choose ‘happy hens’ eggs, which proports to allow their birds to roam free in fields. Wish I could believe them. Do you have a yard, Francene? Maybe your hubby could get a couple of happy hens for your own backyard? Can someone please send me some information on getting some chickens for my backyard for the first time? There are SO many resources online for first time chicken keepers! Do a Google search for “beginning chicken raising” and see what turns up! Then be sure to sign up for my email list and like my vomitingchicken.com Facebook page, so we can stay in touch! I raised my chickens on pasture and I could see the difference in yoke color and how it stood up compared to store bought eggs. I am in the city now but have a large back yard. I have 5 juvenile chickens, and I find they spend most of their time hunting-and-pecking in the composted places under the blackberries and fruit trees. Look for tree trimmers who shred the branches and ask for the chips. I the fall I usually pick up 50-100 bags of leaves for the garden and trees–watch out for trash that is often raked up; and if you pick up from older neighborhoods, watch out for lead-paint chips. BY chickens fun to watch and way to good way get rid of all leftover food except chocolate, raw peas, and things in the onion family. Sorry, but I first posted this under coffee. Watch out fort auto-fill!